I often use the great flavor combination of maple and pecan. 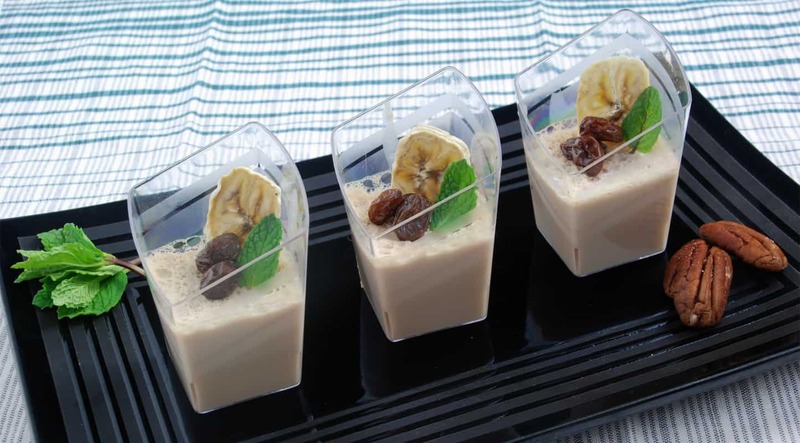 For this recipe I infused milk with toasted pecans and maple syrup. Then I turn that infused milk into a tender panna cotta with some carrageenan. The panna cotta is very tender so be sure you let it set in the dishes you are going to be serving from because it's almost impossible to transfer once the gel is set. I normally serve these in small bowls or shot-sized glasses with small spoons. If you don't have a whipping siphon you can infuse the raisins by leaving them in the spiced rum for several days and up to a few weeks. If you would like more information about the modernist techniques, ingredients, and equipment used in the maple-pecan panna cotta recipe you can check out the following. Heat an oven to 350°F (176°C). Toss the pecans with the canola oil and spread out on a sheet pan. Bake for 10 to 20 minutes until lightly toasted. Let cool slightly. Combine the roasted pecans and the milk in a pot and bring to a simmer. Stir in the maple syrup and remove from the heat. Let the mixture cool some then refrigerate it for at least 12 hours and up to a few days. Remove the mixture from the refrigerator and strain it to remove any large pieces of nut. Combine the rum and raisins in a whipping siphon. Seal the siphon, charge it, and shake well. Let the raisins sit for 20 to 30 minutes, either in the refrigerator or on the counter. Vent the siphon then pour out the infused raisins and rum into a container. They are ready to serve or can be stored in the refrigerator for weeks. Place the maple-pecan milk in a pot. Add the iota and kappa carrageenan and blend well with an immersion blender. Bring to a boil and whisk for 30 to 60 seconds. Remove from the heat and pour into the serving cups or bowls. You can also let the milk cool slightly before pouring into the cups or bowls if they are not heat resistant. Let the panna cotta cool at room temperature, or in an ice bath, then place in the refrigerator to finish setting. The panna cotta should last for several days covered in the refrigerator. 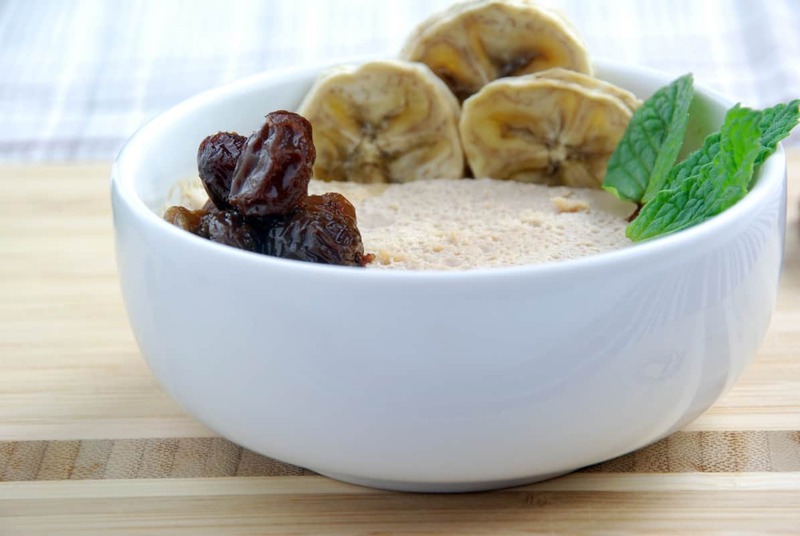 Remove the panna cotta from the refrigerator, top with the-banana chips and infused raisins then serve. 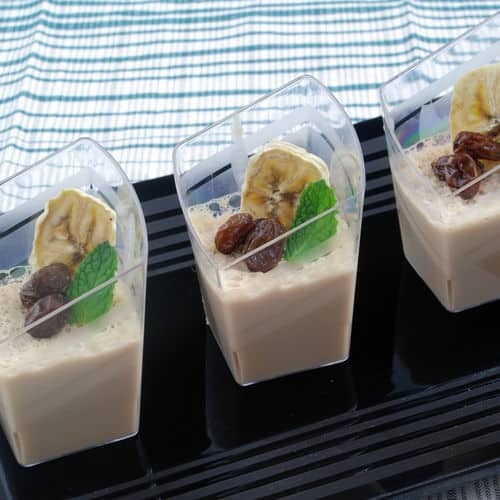 The maple-pecan panna cotta recipe uses the modernist ingredients of iota and kappa carrageenans, and an immersion blender and whipping siphon pieces of equipment to make this favorite tender dessert.